Dogs who play nice with other dogs, are current on their vaccinations, and enjoy the company of other dogs will have a great time in our Doggie Day Care! Our resort staff supervise all play groups and engage our day care guests in a variety of activities. Multiple indoor/outdoor areas for playgroups allow us to keep play groups safe and divide dogs of similar size and play style. 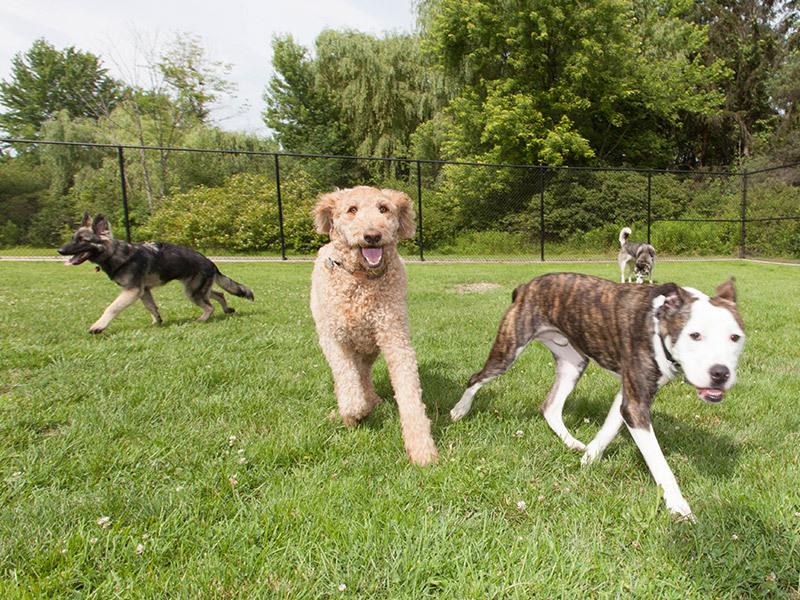 Our 2,000 square foot indoor/outdoor daycare center, dog-friendly playground equipment, and seasonal wading pool will give your dog plenty of activities to choose from. Dogs that are boarding with us get daycare at Discounted Rates! What Is the First Step to Joining Doggie Daycare? All guests who will join our doggie day care groups must first participate in a 20-minute pre-assessment interview. Because the safety of each dog participating in our day care program is always our first concern, we will ask you a variety of questions about your pet’s activity level, exposure to other dogs, and interactive style with both unfamiliar people and other dogs. There is no charge for the assessment interview but we do require an appointment. Please call 716-549-1761 to enroll at the Angola location, or 716-873-0450 to enroll at the Tonawanda location. When Can My Dogs Play? Weekdays and Saturdays dogs can come and join the fun anytime. After we do our initial evaluation with your dog, there is no appointment needed! Consider Doggie Daycare while your house is being remodeled, while you have house guests who aren’t comfortable with dogs, or when you just want your own “down time” to yourself. You’ll be able to concentrate on your other activities and commitments, and your dog will come home satisfied, happy and “pleasantly pooped”! What is the Daycare Play Schedule? More play time: 1:30 – 5:00PM for non boarding dogs. 4:00PM for boarding dogs. Dogs go to runs/crates/boarding room for lunch and a rest period before going home and/or being feed meals. This is to help reduce the risk of an upset stomach or bloat. Dogs have access to water at all times. Sunday: Daycare is offered for boarders and available for non-boarders by appointment. EZ PASS – Buy a “10 full-days” Package and save $10! What is Considered a Half Day? Half Day AM: Check in anytime after 7:00AM. Check out by 12:00 PM. Half Day PM: Check in after 1:30PM. Check out by 7:00PM.